Travelling in Trains – Mumbai Edition. There was a time I was one of the many footboard travellers on a Mumbai aka Bombay train. These days am out of touch and am comfortable boarding a dubai metro..
Making a journey in a Mumbai Local is an experience in itself. If you have been to this city and haven’t boarded a electric train on any of the three routes that ply through the metropolis, it means you have missed half the fun or half the nightmare, depending on the experience…. This story goes back to my school days in Bombay, now Mumbai, where I grew up. The 4 storeyed building where we stayed had around 72 tenants. Each tenant had a home of 450 square feet that included a living room, a kitchen and a bathroom.The ground floor had an assortment of shops that had 2 laundry shops, 2 clinics, 3 groceries, a tailor, a medical shop, a co-operative bank, classrooms of a school and now to the central character of this story, the civil supplies ration shop. The locality spread across roughly 30 plus acres was called Abhyudaya Nagar which had around 45 such buildings, and also had the Kalachowky police station quarters opposite our building. The nearest railway station was Cotton green. To serve these tenants, around 3000 and amounting to an average of 15000 people, we had 6 or 7 such ration shops in the locality. Since this particular ration shop was in our building, in my running around the building during play time and my weekly visits to buy our monthly ration of rice, sugar, kerosene and sometimes wheat, I became friendly with the owner of the shop, who also acted as the cashier. His job was to check the ration card, similar to a bank’s savings pass book and give out necessary receipts after collecting the payment. There was another person to help him dole out the ration to the customers as they came in whenever any or all of the above mentioned commodities was made available. The wheat, sugar and rice came in jute gunny bags on lorries or trucks. Kerosene used to come to these shops on bullock carts from the nearby Sewri Indian Oil godowns at a distance of 3 kms. A 500 litre tank was drawn by one bullock, and sometimes the 1000 litre tank that made its appearance to these shops were drawn by 2 bullocks. In those days, the rationing for kerosene, priced at 1.20 INR per litre, was anything from 20 litres for a small family for a month or more based on the number of members listed on the ration card. Since kerosene was a scarce commodity and strictly available only in ration shops during the early late seventies and early eighties, people used to flock to these shops in great numbers whenever such carts made their visits to the shops. At such occasions, during my playtime that would start at 3 pm to 5:30 pm, I sometimes used to volunteer for support to give the grains and sugar to such customers, since the only man was busy managing to give kerosene and grains at the same time. The shopkeeper liked me coming, since as I was known to him, and did not mind me helping him and thereby increasing the throughput and reducing the waiting time of customers in the queue. I never went every day, as I could now remember but made it a habit of chipping in only when the kerosene carts came and when the queue was more than 15 to 20 people. Some people especially ones from my building was only too glad to see me serving them. There was one occasion when an old woman from the police quarters who blessed me saying, “Son, you will be never be want of food in your life for what ever help you are rendering to us”. It was during those formative years that I learnt my initial customer service and support lessons. Once, during my 9th standard, these consortium of such 6 or 7 ration shops decided to bring a lottery scheme for all the ration card holders in this area, and the shop owners went to each and every home and sold lottery tickets which had the first prize as black and white television and other prizes which I do not remember. During those times, since color televisions had not appeared, the black and white one costed as much as 5000 INR, a costly luxury item for most of the people. They came to my house and our shop owner asked my mother to buy at least 10 tickets each costing 2 INR to which she obliged, since she did not want to upset either him or me who was present at that time. 2 rupees itself was a big amount in those days, because you could buy a kilogram of sugar or rice or wheat at that time. When Apsomji got up at 5 in the morning partly because of the alarm bell ringing and also because of the commotion caused by his few followers who had already entered his visiting room, he knew it was going to be a good day. Sometimes he was wary of these followers who had been acting as his disciples, advisers and red tape, all put together. Their clamoring was so much that he had always thought of sacking them all or at least put sack cloth over their loud mouths. There was no privacy in the sense, as he could sense it from the bed room. Here he was only getting up and they were walking into the dining room now as enforcement sleuths would walk in uninvited and treat themselves to food leftovers in the refrigerator and on the table. Still, Apsomji thought, they were needed to give him company and vet on his ideas that steamed from his head. Today was going to be a good day, as he stretched his arms, went through his yogic motions followed by the rush to the bathroom to complete his ablutions. When the warm water was falling from the geyser, he was wondering what pep talk should he be doing in front of the European delegation who were in town to gauge and most probably reward his city for its cleanliness and care of labor and destitute people. Apsomji as Mayor for the last 2 years, had been made aware of this comprehensive clean city trust that was set up some place in Luxembourg. Apsomji was a poor reader and whatever information he got was from his sycophant gathering of the above mentioned followers. This award specially set up for cities in developing nations, they had told him was to be awarded if certain conditions were met. On top of the list was – There were to be well-managed slaughter houses, proper waste management, clean drinking water and no overflowing drains, no sight of child labor, no barking strays and polluting vehicles and of course presence of a few parks and gardens to counter the greenhouse effect. Apsomji was a little confused as to how a green park could counter a green house, but he left it to his intelligent team to figure out. The past few weeks had been hectic for his supporters and people in high offices who helped him to design the itinerary and chart out the survey course through select places in the city, which would keep off-limits, the dark areas away from the sight of the trust members who had flown in 3 days back. If only he could trust them to deliver the coveted award to his city. Apsomji and the corporation members made sure that the award committee visited few looms (hand-loom enterprises) where no child labor existed, a few eateries where everyone who worked was above 18 or made to look like that. A visit to a park that was renovated this year and what was previously a deserted junk yard was also on the list. Slaughter houses were cleaned up and the animals lined up and cleaned up one day in advance. Drains were covered with hard sheets and very feeble concrete slabs that would break if a vehicle went over it. All these were laid out just in time before the motorcade of the visiting luminaries went that way. All strays were rounded up or those who could not be, were chased away in such a ferocious manner that the corporators knew they dare not enter the city limits again. Clean drinking water taps were setup, 100 in all, at various points, around 30 across the course that the award committee were to travel and visit on feet. 70 sweepers were employed on a 5 day shift and most of them were child labor. The terms and conditions read – They were to sweep the streets early in the morning and never to be seen again in the daylight. Brooms were given to them but no collecting buckets for the filth they were supposed to sweep. These should be collected as heaps, so that in the morning run, the sewage vans would collect them. Since 2 weeks, around 100 traffic policemen were given the additional responsibility of noting and chasing down vehicles with polluting exhaust. Those who belonged to the polluting lot however belonged to the city corporation buses and these were asked to keep off the roads on the day of survey. It was rumored that a traffic inspector who went running after one such vehicle had his white uniform turned to black and was in the hospital wheezing it out. The waste dumping yards, all three of them which the city had, had got a carpet of sand over the now rotting junk. This sand would help control the stink emanating from it, as per his genius corporators. Another set of volunteers of the CLEAN CITY CAMPAIGN promoted by the corporation had rounded up the rag pickers most of them children, beggars, the old and the infirm who were seen on the streets and packed them off to a home in the suburbs for a week till this thing would get over. After his bath and breakfast, Apsomji with his followers neatly dressed went over to the corporation office ground next to which a dais had been erected to seat the award committee members and the corporators. He made sure that the newly put up dais could hold the weight of at least 20 people sitting and 20 people standing and another possible 20 rushing on to it in the last-minute by doing a dry run. Everything looked perfect. The dignitaries, 5 of them, were to start of from their hotel on their run up passing several points in the city as per the scheduled path that the corporation had charted out for them. They were thinking of using an open jeep for the purpose but the clouded skies that looked imminent to drop tons of water forced them to use covered cabs. After all, they could always get down with umbrellas to inspect anything if they wanted to. As they had their breakfast in the hotel, there came the rain that was helped by the monsoon winds which was holding out for so long. Now with no holds barred, the pouring rain stood its ground for a full 40 minutes to register a 4 cm rainfall. With the high tide now against the Mayor and his corporators, the drains got flooded up in no time and as the touring party left the hotel in cabs, they were witnesses to the flooded conditions of the city roads in rainy times. Out came their notepads and drainage was given a very low score. When they visited the slaughter-house, it was pouring water over the tin sheets on to the meat and the animals huddled up. The stench was unbearable, as the drains had vomited out the filth back on to the well cemented floor. They left in a hurry in a nauseating state. The water in the roads, in the parks and the waste dumping grounds had cleared up everything that was supposed to be hidden. A cow which had a fall in one of the covered gutters just managed to climb in front of the approaching motorcade to visually treat the guests with the black coat of paint it had acquired on its legs from the drain. The city was churned up with waste with all the money invested to make it clean going down the drain. There were still a few street boys here and there with gunny sacks on their shoulder trying to pick things that could have some salvage value from the flooded streets. Sadly, the dignitaries could not get down anywhere as most places had rising water till knee height. When they reached high and dry ground at one place, one of them got down and opened one tap to inspect. The sound of air gushing at first made him jump and then muddied water came out, all to his disgust. Grimaced with suffering at the plight of the city dwellers, the visitors rounded off the survey, half way, and made their way to the corporation grounds. 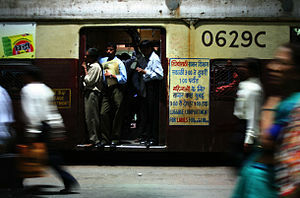 Making a journey in a Mumbai Local train is an experience in itself. If you have been to this city and haven’t boarded a electric train on any of the three or four routes that ply through the metropolis, it means you have missed half the fun or half the nightmare, depending on the experience…. The daily commuter first walks, then jogs and finally does the steeple chase run to complete the last lap towards the station. The steeple chase is chosen only when he sees the train pulling into the station. During such occasions, everyone like others, just run across the tracks, then on to the station platform. Maybe the local commuter can qualify himself for long jumps and high jumps. The long jumps do come in handy especially during the rainy season. It is all about people management and the looks that you exhibit while boarding which does the trick. Every one has to be aware of the fact that nobody on board likes to welcome yet another addition to the already woe full compartment with all its characters. One has to look humble but strong enough to show others that he is fit enough to survive the journey. Don’t have to ruffle your hair every minute, if that is your style. Less chances that your pockets will be picked. Helps your biceps and shoulders if you are hanging on the footboard. Less chance of the shine on your shoes being messed by someone stamping on them. Do not get infected by freely floating bacteria and viruses inside. Do not have to worry about escape, if a fire or a fight starts…whichever is earlier. Corns on your hands by holding tightly on the handle or the door frame. You might reach a destination that you never intended to. Chances are that you may not get a chance to board again. A fellow passenger dragging you with him, once he slips. Getting rid of loose papers from your shirt pocket. Cannot use the comb, or you will reach your tomb. Getting down from a train is not a big task as compared to the boarding one. But still people have to be wary about how they are positioned while getting down. If you are too near the door, chances are that you will be pushed out before you have time to complain or explain. If you think you can handle the situation being at the end of the lot trying to get down, that is a big mistake. You will, to your surprise discover a crowd of people barging their way in and you might have to abort your landing. Trains like planes, especially the local trains do not wait for their passengers to alight or board. They have their own fixed seconds in which everything happens. “Time and Train do not wait for anyone”. People who had to alight here because they could not get down at the last station. People aborting their journey because they lost their purses midway, lost the wristwatch, lost the will to go to work, or because they got a call on their cell phone from their dear ones to come back. People who decide as to how to escape ticket checkers. People who got on the down train by mistake when they wanted to take the up train. People who were travelling the whole day because boarding a train was cheaper than boarding a hotel.